A while back, I had the pleasure of the company of Tony Healy who was visiting from Australia. He was on a trip around Britain and elsewhere to see not only friends and relatives, but places of cryptozoological interest. Previously, Tony had been to Loch Morar back in 1979 researching various cryptids for a book he hoped to publish called "Monster Safari". With Tony's consent, this story is based on material taken from the manuscript for that book. Back in 1979, he had visited a Charles Simpson regarding a sighting of the Loch Morar Monster being briefly seen almost wholly out of the water. Quite briefly in fact as it was lurching over a strip of shingle. Tony sent a summary of the story to the editor of the local magazine, "West Word", which published the story in its March 2000 edition. I quote the article here. Last summer, West Word offices were visited by Tony Healy, an Australian author who is interested in Morag and other legendary creatures. He had visited the area 21 years ago and talked then to Charles Simpson of Mallaig about Morag. Now writing a book, Tony came into the office to look at back copies, and went away with those which have mentioned Morag, to have a chat with Ewan MacDonald, who has also sighted the monster. Tony has now sent us this account, and allowed us to reproduce the photo of the painting made of the creature seen by Donald Simpson 25 years ago. On 27th November 1975 Charles and his brother Donald (who died a few years later) were driving towards Bracorina on a bird watching expedition. The Morar River, as it leaves the loch, flows over a narrow ridge of gravel, so that for a short distance it is only a couple of feet deep. At 3 p.m., just as they were passing that spot, Charles, who was watching the road ahead, heard his brother, who was driving, suddenly gasp and choke as if unable to breathe. What Donald had seen was a powerful, 20 foot long animal which rose out of the river less than 40 feet from the car. It lurched across the gravel bar and sank into the deeper waters of the loch. The episode lasted only a couple of seconds but made a deep impression on the man — who had previously been very sceptical about the Morag legend. He said it had smooth brown skin "like a drum" and commented particularly on the muscles in its powerful hindquarters, which were evident as it hauled itself over the gravel bar. He saw no ears or eyes but said there was what looked like a "trunk" trailing along the side of the body. Shortly afterwards, under Donald's close supervision, a neighbour executed a small watercolour painting of what he had seen. "Donald said it wasn't exactly right"' Charles Simpson explained, "but said it conveyed the general impression of what he saw. Because the sighting was so unexpected, so startling and so brief, he couldn't even say for sure whether the "trunk" was attached to the front or the back of the creature, but it is interesting to note that long, flexible, trunk-like appendages — which are usually thought to be the snake-like head and neck of the creatures have often been reported at Lochs Ness and Morar. Because, like his brother, he was a highly respected man, an elder of the church and an authority on the wildlife of the area and because he was much too close to the massive creature to have been mistaken — I fully believe Donald Simpson's account: what he saw must certainly have been one of the legendary Loch Morar monsters. Twelve years on from this report, Tony sent me additional notes and comments. Charles Simpson took Tony to meet Donald's widow, Jessie, who showed him the painting. The local artist was a man by the name of Willie Kirk of Mallaig whom Tony caught up with on his last visit to Loch Morar. Willie seemed a bit of a reclusive chap to Tony who had no problem allowing his painting to be put in the public domain. Having spoken to them and others who spoke well of Donald Simpson led Tony to believe that there was no hint of deception in their tale. Add to that the fact that Charles was expert in recognising local wildlife and the creature was only forty feet away further reinforced Tony's conclusions. As to the location of this event, Tony also sent me a photograph of the location where he thinks it all happened. As I said, it was not quite a full blown land sighting. The shingle bar was about two feet under water and so our creature technically never fully left the water. By using Google Maps, the location can be confirmed via StreetView below. The first map shows Loch Morar in relation to Loch Ness. The second map circles the location of the sighting. The witness said he was only about 40 feet from the creature which is borne out by the next StreetView picture which shows the road they were travelling on beside the loch. 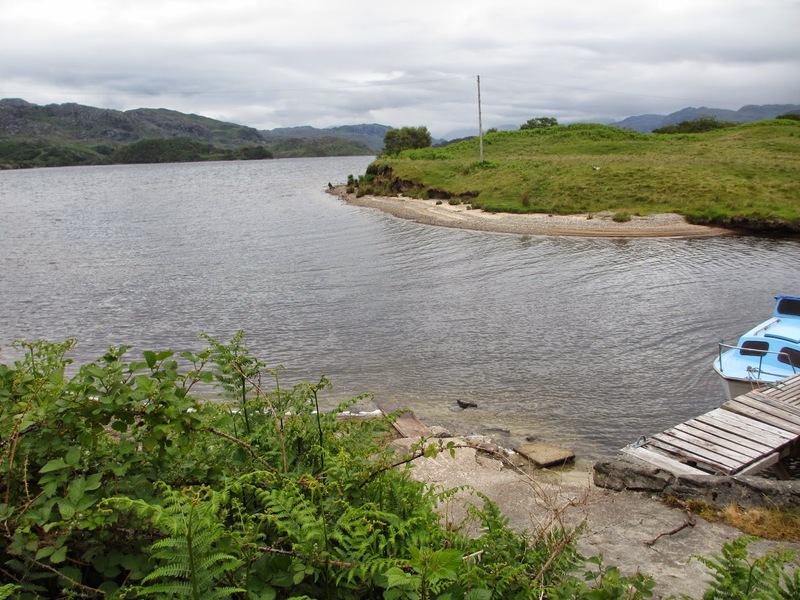 The thing that has to be said about the creature depicted in the painting is that it is moving from right to left as it hauls itself across the shingle bar out of the River Morar into Loch Morar. Anyone looking at the painting with a Nessie mindset would presume the trunk like object is a long neck and hence the beast is lumbering from left to right. This is not the case, which may present a bit of a conundrum, although the rapidity of the sighting does allow for some uncertainty as to how this appendage actually attached itself to the body. However, if one presumes it is the tail rather than the neck (which has by then submerged to the left), then the image perhaps becomes clearer. Using a formula mentioned here before, in terms of witness credentials, proximity and clarity, it is a good report. The one thing that one would wish more for is the duration of the sighting, which is mere seconds. The longer, closer or clearer the sighting, then the less chance of misidentification. But, then again, what kind of creature could be misidentified? Once again, the ubiquitous seal may pop into people's minds, but apart from being 20 feet long and brown in colour, there is another obstacle to that theory and it is a physical obstacle. I am talking about the hydroelectric dam just up the River Morar which has been in place since 1948. On that basis alone, seals can be excluded. But, of course, what the dam prevents coming in, it also prevents going out. Is Mhorag forever stranded in Loch Morar? If Mr. Simpson's description of "powerful hindquarters" is accurate, then perhaps not. What the painting conveys is a bit of a mystery to me. That a degree of inaccuracy is acknowledged by the witness adds more uncertainty. The most interesting quote refers to the "muscles in its powerful hindquarters, which were evident as it hauled itself over the gravel bar". It would seem that Charles Simpson saw enough to see impressive musculature in action. But "powerful hindquarters" is not a term I readily equate with lake monsters. It is something I would more relate to the lion crouched ready to race after its prey or something else more land-bound. Indeed "powerful tail" or "powerful rear flippers" would be more appropriate terms for lake cryptids. But, this is not so much a mystery if the amphibious attributes of the Loch Ness Monster are assigned to the Loch Morar Monster. What does seems certain, though, is that a large, powerful creature was seen entering Loch Morar nearly forty years ago. It is also about forty years since a book was written on Mhorag. Perhaps Tony or someone ought to do an update on Nessie's famous relation? Hi Roland nice to meet you by the way, and I am more then happy to inform you in relation to my personal Loch Ness experience it happened some years ago 2002/2003? One early morning I came back from the toilet block walking in the direction of my tent when I heard several fish jump which I recognized having done a lot of fishing with my father back in Holland. Further enquiries placed the event in late August or early September of 2003 at a time of about 1 or 2 in the morning with cloudy but dry weather. This audible encounter happened at the Invermoriston Caravan and Camping site which is circled on the map below. Now, this is more of a "hearing" than a "sighting" and such encounters are rare to say the least. Given the time and month, I would doubt if J.S. would have seen much at all out on the loch. I have myself seen fish jumping out of the water ahead of what may have been a silent and invisible predator. Not necessarily a Loch Ness Monster, but certainly bigger than the fish in retreat. That may have been the closest I got to seeing our elusive monster. Be that as it may, a large splash normally requires a proportionally large dose of energy which would require a combination of a fast and/or heavy object. What could J.S. have heard? The ubiquitous seal may be trotted out at this point. Seals are the second largest animals that may be found in the loch. However, when they are sometimes suggested as an explanation, one wonders if there was one actually in the loch at the time of the given report? After all, they only turn up in the loch perhaps once every two years when they pursue salmon or trout from the Moray Firth. They normally end up getting shot. So it is no surprise that the times the loch has no seal in it easily outweigh the times there is one or two in it. Or perhaps someone was just dumping something in the loch, or "fly tipping" as we call it? I would only say that the roadside is quite close to the lochside at the campsite in question, so the dramatic noise one would get from an old, useless cooker tumbling into Loch Ness from a high road point is lost at this particular location. But I get the impression here that J.S's noise was out there in the loch rather than one originating near the shore, especially when he saw the waves come rolling into the camp shore (he had gone to the shingle shoreline to witness these as his vision got back to normal about a minute later). If J.S. did hear our loch leviathan then that gives me encouragement. Not just because Nessie again has made her presence known in recent years, but because it occurred in the early hours, a time of day which I believe the monster is more active in (as regular readers will know from my infra-red work). As ever, comments and interpretations are invited from other readers.